Sleepless Juggler: Gotta Love It! There are so many wonderful things to do with children this time of year! We had fun decorating, shopping for gifts, wrapping presents, going to see holiday lights, making gifts, making reindeer food, participating in Christmas programs and cantatas at church, and visiting with family! 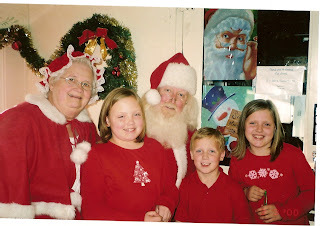 My children are perfect ages for celebrating and having fun with the anticipation of the season. 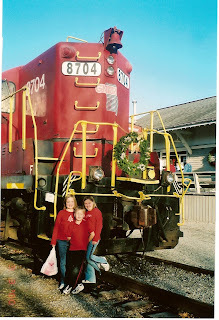 Last Saturday, we went with my parents to Blue Ridge, Georgia and took a train ride with Santa. While we traveled from Blue Ridge to the Tennessee border, we sang Christmas songs, heard a Christmas story, played some games and enjoyed the beautiful scenery. At the end of the ride Santa, Mrs. Claus, and two elves arrived to talk to each child, give us all bells and candy canes, and allow us to take pictures. We had a lot of fun. One of our Christmas traditions is to bake cookies for Santa, of course. Every year we make Peanut Butter Kisses and Buckeyes. Both are good recipes for kids. They love rolling the dough into balls, rolling the balls in the sugar or dipping them in chocolate, and putting the kisses on the cookies. They are good recipes for this mother because they only have 3 ingredients each and a couple of simple steps to the recipes. So, for my family Peanut Butter Kisses and Buckeyes are a win-win situation. This year, we tried a new cookie with a surprise middle. I got this recipe from watching Paula Dean make it on the Food Network. They are delicious, but HUGE! You can't eat more than one of these at one sitting! I'll post the recipes for all three cookies below. Preheat oven to 350. Combine ingredients in a medium bowl and mix until blended. Roll heaping teaspoonfuls of dough into balls. Roll in a bowl of sugar. Bake for 12 minutes or until set. Place unwrapped Hershy's Kiss on top of cookie and let set. Cream together butter and peanut butter. Add confectioners sugar. Roll into balls. Dip into melted chocolate. Place on wax paper. Place slices or sugar cookies on greased cookie sheet about 2-3 inches apart. Top each with a chocolate wafer. Cover wafer with another slice of cookie dough. Brush dough with a beaten egg. Press nuts into top of dough. Bake for about 10 minutes. These need to go in the family cookbook. The next edition will have a section for kid-friendly recipes. Fun, Fun!